If this is your first time ever hearing the words ‘vacuum’ and ‘siphon’ to refer to coffee makers, it’s understandable to feel somewhat…overwhelmed. After all, one look at a vacuum coffee maker and most people wouldn’t even bother because of its complicated design. However, this technology has been around for almost two centuries now and it could be a great, new way to experience coffee if you’re tired of drinking the same old cup of joe in the morning. Besides, the best siphon vacuum coffee makers in the market nowadays are built in such a way that an average person can operate it with ease. But really, though, how does it even work? Although design may vary, all vacuum coffee makers generally operate the same way. First off, you have two chambers: one on top and another one at the bottom. The bottom chamber is where the water goes and the top one is where your coffee grounds sit on a strainer. You heat the water in the lower chamber and as the temperature rises, the vapor pressure also changes with it, forcing the water to move upward through the siphon tube in the middle. When it reaches the upper chamber, that’s when the brewing starts, leaving just a small amount of water in the lower chamber. There are two things happening in this process: 1) In the upper chamber, your coffee grounds are gradually immersed in water, and 2) in the lower chamber, things remain heated up in order to sustain the pressure that is keeping the water in the siphon tube from going back down while it’s still brewing. After a few minutes, when the immersion in the upper chamber has finished, the temperature drops, but not all at once. Slowly, the pressure eases up and lets the now-brewed coffee through the strainer, away from the grounds, and down the siphon tube. The process of decantation from the upper to the lower chamber is the final step in brewing. Pour it out of the lower chamber. Enjoy. ‘Need’ is a strong word. Like with any type of coffee maker, you should pick one that suits your personality and preferences. If you like your coffee quick and easy like, say, a Keurig coffee maker, or if you have kids running around at home who could potentially break the carafes on a siphon coffee maker, then you might want to reconsider. While I agree that a siphon vacuum coffee maker looks sophisticated on any kitchen counter (and it’s a great conversation-starter for when guests come over, too), that’s not the element of its design that I am talking about. When I say it has an elegant design, what I mean is that the technology and the components are quite unlike you run-of-the-mill coffee maker. They both make everything different: the taste, aroma, and so on. Some might say that it takes coffee-making up a notch – or five. At the end of the day, siphon coffee brewing just really looks cool. If you want something that complements your kitchen interior or if you’re looking for something to use when you’re trying to strike up a conversation with a fellow coffee aficionado, then this might be a good piece to start with. The entire process piques and satisfies your interests. Most people who favor siphon vacuum coffee-making agree on how aesthetically appealing the entire brewing process is – from the water boiling in the lower carafe, the way it rises toward the coffee grounds, all the way down to pouring it into a cup. This is where it gets really good. Unlike in most ordinary coffee makers, a good portion of coffee grounds go to waste because not everything comes into contact with the hot water, whereas siphon vacuum coffee makers guarantee that you get to maximize the flavor of every granule. With a principle that is quite similar to that of French press coffee, you can use gourmet coffee grounds without worrying about not being able to fully experience the flavor. Of all the features of a siphon vacuum coffee maker, this is perhaps my favorite. From the moment the water starts rising up the siphon tube, up to the time you pour it into your favorite mug, the temperature remains fairly consistent. This is crucial when brewing a first-rate cup of coffee. A sudden change in temperature could alter – or even ruin – the flavor and consistency of your coffee. Finally, a great benefit of using a siphon vacuum coffee maker is that you get to experience coffee in all its aromatic glory. The technology behind it makes sure that the aroma stays inside the carafe, so when you pour out the contents into the cup, you can immediately enjoy the crisp and stimulating scent of your coffee of choice. To me, at least, this is something that can’t be replicated by regular coffee makers on the market. This is the primary reason why people go for this type of coffee maker in the first place. Now, onto the best part. Based on the benefits stated above, I’ve selected the 8 best siphon vacuum coffee makers that’ll surely give you a great start to your morning. I did try to show both manual and electronic coffee makers, but given the quality of the coffee produced, manual siphon coffee makers have definitely taken the lead. If you’re a fan of vintage design, you’re going to love this siphon vacuum coffee maker. While the ‘bells and whistles’ make this contraption look complicated, it works exactly like most non-electric coffee makers. The only difference is that it uses a butane burner as its heating source. The reason for this is that it burns much slower. Therefore, it brews your coffee at a slower, steadier rhythm that removes the possibility of burning your coffee grounds. I had a lot of fun brewing coffee on the Yama Glass. I like that the coffee comes out smoother than most coffee makers. However, I wouldn’t try using this during a Monday morning rush. Brewing takes longer to finish because of the butane burner. If you have the patience for it, then by all means, brew on. This KitchenAid siphon vacuum coffee maker is a great option for people looking for something much simpler than a stovetop coffee maker. From the design alone, you can tell that brewing a cup won’t be a hassle. The two carafes are joined together magnetically. I also like that it has measuring lines on the lower chamber just to get the amount of water right. This leaves a lot of guesswork. Just plug it into an electrical socket and wait. There are some people who do prefer the stovetop siphon vacuum coffee makers because it gives them the freedom to control the brewing duration and the amount of heat that they use. Using an electric siphon coffee maker is much more straightforward and instant, not to mention less taxing. You don't need to worry about watching over your coffee pot constantly. It’s nice to just plug it in and do something else out of my morning routine. The overall look of this stovetop siphon coffee maker is pretty straightforward and classic. I’d like to emphasize the 8-cup capacity because it could be perfect for family use or if you just really drink a ton of coffee. It has one of the largest carafes made out of borosilicate glass, which is top-notch when it comes to withstanding heat. It’s the same material used in making glass bakeware, so it really is an ideal choice for a stovetop siphon coffee maker. It’s worth mentioning that there’s a tendency for this to boil over, so you might want to be careful and avoid making a mess in your kitchen. That is the last thing you need in the morning when you’re trying to get to work and I’m saying this based on experience. Classic design; it makes it easier to use without getting overwhelmed. Carafes are made of borosilicate glass, the same material used for bakeware. The Gourmia looks like something straight of an Instagram post. It looks sophisticated, no doubt about it. If you’re looking for something that’s visually appealing and makes good coffee, then this might be for you. But if you don’t like the fuss that comes with manual siphon coffee makers, then the Gourmia coffee machine is the right one for you. The base is actually a control panel that offers you the option between automatic and manual brewing. That makes room for more customization, especially if you’re the type who likes grinding your own coffee beans. Another thing that I liked about this coffee maker is the concealed heating source. That said, it’s not totally ‘accident proof.’ You could still get burned when removing the top before pouring the coffee out, so be careful! Here’s another vintage-looking siphon coffee maker, but this time it’s from Hario. Just like the Yama tabletop coffee maker, it uses a different heating source – alcohol. Unlike the electric coffee makers on this list, this one requires a bit of practice and some getting used to. It’s probably more ideal for the true-blue coffee lovers out there, since it demands more work to get to your ideal cup of coffee. But, to it’s credit, I’d say this one comes closest to barista-brewed coffee in terms of taste and aroma. Again, there’s an appeal to using a manual siphon brewer like this that is similar to experimenting with a chemistry set, but it requires a lot of experimentation to get it right. Bodum Pebo brings us back to the basics with this simple design. If you’ve got 11 minutes to spare, you can have a fresh cup – or eight, which is the maximum capacity – of vacuum-brewed coffee every morning. I really like the straightforward mechanism of this manual siphon coffee maker. I guess one of the downsides is the exposed burner below the actual unit. If you don’t like dealing with open flame, then you might want to skip this. This is a pretty good starter device if you’re new to the siphon coffee brewing game. For one, it’s not as expensive as the others. Also, the temperature and brewing time are pretty standard. No need for much experimentation here. One thing I don’t quite trust about this is the lid. I found that it’s not sturdy enough to last a long time. And with a process like this, sealing in the aroma is very important. This one’s an affordable choice, so if you want good, siphon-brewed coffee but don’t want to break the bank, I think this might be right for you. It’s lightweight, but it’s pretty durable. I can’t help but compare this to the Hario 5-cup siphon coffee maker on this list because they look nearly identical. You might say this is the cheaper alternative to that. I don’t mean that as a bad thing. The Hario TC-5 makes good coffee, so if you’re a fan of that but want something that is more or less $10 more affordable, this can be your go-to device. Of all the fancy-looking things you can use to make coffee, this one takes the cake. It looks like it belongs in a museum, with its gold details and intricate design. This siphon coffee maker looks different from the rest on this list because, for one, it doesn’t follow the standard “one chamber on top of the other” style. As the name suggests, it’s a balance siphon coffee maker. If you value aesthetics, or if you’re looking for something that’s just fun to use, then this might be the ideal siphon coffee maker for you. After trying this one out, I can safely say that it’s not ideal for daily use. It’s very delicate and intricately-made. Despite the price, this is also serves as a novelty piece. It’s really an excellent coffee maker, but I still think there are other siphon coffee makers on our list that can work just as well as the Royal Family Balance Siphon coffee maker. To me, it all boils down to two things: ease of use and ability to produce high-quality coffee. 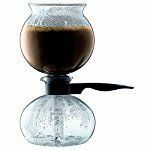 In these areas, nothing beats the classic Yama Glass Tabletop Ceramic 20-oz siphon coffee maker. It balances design and functionality without sacrificing the quality at all. The KitchenAid electronic siphon coffee maker comes in second place simply because it can be the perfect go-to siphon coffee maker for daily use for busy people. The latter can make a vacuum-brewed cup of joe easily accessible to the Average Joe. So, there you have it, folks. Review the features of each coffee maker carefully and find out which ones are most suited to your needs.